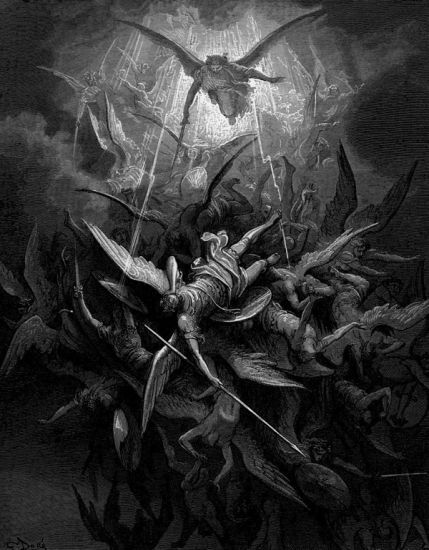 This article will cover more on the 'eternal' nature of hell (contra 'Annihilationism' and 'Conditionalism'), in particular a large collection of writings from the early Catholic Church (Fathers, Saints, Bishops, etc) and commentary from prominent Church historians and experts on the subject (e.g. Fr. William Jurgens, Ludwig Ott, and especially, Brian E. Daley, SJ on Christian eschatology). "....I have dozens of quotes from the early Church Fathers that universally taught universal salvation .... now you can go to Tentmaker.org and get all this information...." (Gary Amirault, Tentmaker Ministries, in response to Jerry Walls on Lee Strobel's 'Faith Under Fire')"
Whether you are a Christian or not, this is not a pleasant or comfortable topic to study or think about. NOBODY likes the 'idea' of HELL. However, if it is TRUE, it is clearly very important as it deals with our eternal destiny. Unlike most Internet sites, I will be documenting this article from the best scholarly sources I can find (see Recommended Sources). early Church history (some post-apostolic writings that are relevant, with commentary). I do not deal with the emotional or difficult philosophical/moral objections to this teaching. I admit it can be hard to accept or explain such a belief in light of a God of love, mercy and forgiveness. That may be the subject of a future article on this site (see books and links at end for some further answers). Cf. Luke 16:22; 23:43; Matt 16:26; 2 Cor 5:8; Phil 1:23; Heb 9:27; 12:23. Cf. Council of Lyons II (1274):DS 857-858; Council of Florence (1439) : DS 1304- 1306; Council of Trent (1563) : DS 1820. Cf. Benedict XII, Benedictus Deus (1336):DS 1000-1001; John XXII, Ne super his (1334) : DS 990. Cf. Benedict XII, Benedictus Deus (1336):DS 1002. 1033. We cannot be united with God unless we freely choose to love him. But we cannot love God if we sin gravely against him, against our neighbor or against ourselves: "He who does not love remains in death. Anyone who hates his brother is a murderer, and you know that no murderer has eternal life abiding in him." Our Lord warns us that we shall be separated from him if we fail to meet the serious needs of the poor and the little ones who are his brethren. To die in mortal sin without repenting and accepting God's merciful love means remaining separated from him for ever by our own free choice. This state of definitive self-exclusion from communion with God and the blessed is called "hell." 1035. The teaching of the Church affirms the existence of hell and its eternity. Immediately after death the souls of those who die in a state of mortal sin descend into hell, where they suffer the punishments of hell, "eternal fire." The chief punishment of hell is eternal separation from God, in whom alone man can possess the life and happiness for which he was created and for which he longs. Cf. Matt 5:22,29; 10:28; 13:42,50; Mk 9:43-48. Cf. DS 76; 409; 411; 801; 858; 1002; 1351; 1575; Paul VI, CPG - 12. LG 48 - 3; Matt 22:13; cf. Heb 9:27; Matt 25:13,26,30,31-46. Cf. Council of Orange II (529) : DS 397; Council of Trent (1547) : 1567. Christian 'universalism' (everyone eventually goes to heaven and is 'saved' by Christ -- a much smaller minority believes this). These all claim 'Scriptural support' for their beliefs. This proves that our personal interpretations of Scripture are not 'definitive' nor 'binding' on all Christians, i.e. what is to be believed as true and 'essential' by all, etc. In evangelical or 'Protestant' understanding, we simply have to 'agree to disagree', etc. In Catholic understanding, what is to be believed by ALL Christians is reserved for the unique role of the Magisterium or 'teaching authority' of the Catholic Church. Catholics and Protestants (and Orthodox, and other Christians, etc) disagree on the nature of authority here, but we can agree that the Scriptures are A infallible rule of faith for determining Christian doctrine. So let us 'search the Scriptures' (cf. 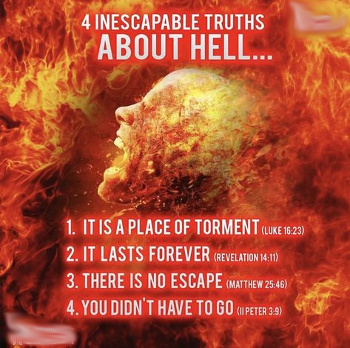 John 5:39; Acts 17:11) and see what we can find on the nature of 'hell' from the most explicit and clearest texts (there may be disagreement on what those are, but several of them were already referred to above in the Catechism). the rich man (Dives, by tradition) and Lazarus story which clearly talks about the rich man dying and being "in hell [Hades]"
where he was conscious and "in torment" experiencing a "place of torment"
and being "tormented in this flame" [or "in agony in this fire"] (Luke 16:19-31) -- Is this merely a parable? Why? "cast into hell fire [Gehenna] . . . "
". . .where the fire [Gehenna] never goes out (or shall never be quenched) [3x] . . . "
". . .where their worm does not die [3x]" (Mark 9:43-48). "shall be reduced to nothing"
"utterly vanished to non-existence of being"
"completely annihilated so they will be no more"
"temporary fire" or "quenchable fire"
"brief punishment" or "tormented for a day"
"where the fire [or punishment or torment] is temporary and goes out [or stops or ends]"
"where the worm dies" and "they die with their worms", etc. Or similar clearer phrases for death, or destruction, or annihilation, obliteration, extinction of being, temporary duration, etc. Now Christ and the NT writers DO use SOME of these terms (namely death/die and perish/destroy) which will have to be explained for a comprehensive view. However, we should START with the most explicit and difficult and clear passages of the orthodox, traditional doctrine and not IGNORE OR AVOID THEM or wait until later to cover them. Deal with them up front. The plain reading of all these passages above is that the FIRE connected with Gehenna, "prepared for the devil and his angels", where unrepentent sinners and unbelievers go . . . These are the strongest texts that could be brought forward (in my opinion) for the orthodox traditional view. What is the response to such texts from those who wish to DENY that hell is eternal and/or doesn't involve eternal punishment and torment? There are several objections, both biblical and philosophical / theological / moral and I may deal with those in a future article. Sorry to cut this short, but this article was becoming way too long. Kind of like, well, hell. I'll end this section with what must be believed (what is -De Fide- or "Of divine and Catholic Faith") from an orthodox Catholic perspective (see Ludwig Ott, Fundamentals of Catholic Dogma, his section on "Last Things" or Eschatology, pages 473-496) on heaven, hell, and purgatory. For an ecumenical book on this subject, I would recommend the book Heaven, Hell, and Purgatory: A Protestant View of the Cosmic Drama by Jerry L. Walls (Brazos Press, 2015). This section covers about twenty+ individual Church Fathers, bishops, saints, or Christian writers from the early Church (from Barnabas and Clement's "Letters" in the first century to St. Augustine's writings in the early fifth century). After having collected and studied these patristic selections (my primary sources are Akin's The Fathers Know Best and Fr. Willis The Teachings of the Church Fathers along with commentary from Fr. Daley and others, etc) I discovered these writers are very clear about the eternity of hell, eternal fire, and eternal punishment (although not the precise 'nature' of these where Scripture itself does not provide the 'details'). With the possibility of Origen (and those later influenced by his writings), there are NO 'conditionalists' or 'annihilationists' or strict 'universalists' among the Church Fathers. As unpleasant as the HELL doctrine is, it was a UNANIMOUS teaching of the Catholic Church, the Eastern Orthodox churches, most later Protestant communities, and especially the earliest Fathers, Bishops, and Saints. Although an important early ecclesiastical writer, he is excluded from this list below which covers mostly orthodox saints and bishops of the Church. Of the way of darkness, that is, what kind of persons will forever be cast out of the kingdom of God. [Jesus] shall come from heaven with glory, accompanied by his angelic host, when he shall raise the bodies of all men who have lived, and shall clothe the worthy with immortality, and shall send the wicked, endued with eternal sensibility, into everlasting fire with the wicked devils. (ibid, 52; Akin, Fathers, page 394). The Lord has taught with very great fullness, that souls not only continue to exist, not by passing from body to body [e.g. false idea of 'reincarnation', etc], but that they preserve the same form [in their separate state] as the body had to which they were adapted, and that they remember the deeds which they did in this state of existence, and from which they have now ceased -- in that narrative which is recorded respecting the rich man and that Lazarus who found repose in the bosom of Abraham. In this account He states [Luke 16:19-31, etc.] that Dives knew Lazarus after death, and Abraham in like manner, and that each one of these persons continued in his own proper position, and that [Dives] requested Lazarus to be sent to relieve him -- [Lazarus], on whom he did not [formerly] bestow even the crumbs [which fell] from his table. [He tells us] also of the answer given by Abraham, who was acquainted not only with what respected himself, but Dives also, and who enjoined those who did not wish to come into that place of torment to believe Moses and the prophets, and to receive the preaching of Him who was to rise again from the dead. By these things, then, it is plainly declared that souls continue to exist that they do not pass from body to body [i.e. no 'reincarnation'], that they possess the form of a man, so that they may be recognised, and retain the memory of things in this world; moreover, that the gift of prophecy was possessed by Abraham, and that each class [of souls] receives a habitation such as it has deserved, even before the [Final Day of ] judgment. The doorkeepers of the [heavenly] kingdom are careful and they do not play games. They see the soul bearing the marks of her banishment .... Then the miserable soul, accusing herself severely of her own thoughtlessness, and howling and wailing and lamenting, remains in that sullen place, cast away as if in a corner, while the incessant and inconsolable wailing takes vengeance forever (Against Those Who Resent Correction, Migne PG 46:307-316; from Jurgens, Faith, volume 2, page 57-58). [ NOTE: Greek given by Jurgens who comments: "Nevertheless, Gregory's eternity of punishment must, in view of his numerous fuller statements elsewhere, be taken only in a relative sense. Gregory's [Greek given] is the Origenist [Greek given] except that Gregory's is really final, whereas Origen's repeats itself in endless cycles. Gregory seems to be convinced, at any rate, that ultimately all men and the fallen angels with them shall return to God." Jurgens, Faith, volume 2, page 58; see also Quasten, Patrology: "It is especially in his eschatological views that Gregory proves himself a disciple of Origen....Although he speaks repeatedly of 'the inextinguishable fire' and the immortality of 'the worm', of an 'eternal sanction' ... although he threatens the sinner with eternal suffering and eternal punishment, he could not imagine an eternal estrangement from God of his intellectual creatures and explains elsewhere these expressions as referring only 'to long periods of time' ... He believes with Origen in the universal restoration at the end of time (apokatastasis), and in the complete victory of good over evil ...." (Patrology, volume 3, pages 289-290) ]. This is no small subject of enquiry which we propose, but rather about things which are of the first necessity and which all men enquire about; namely, whether hellfire have any end? For that it hath no end Christ indeed declared when he said, 'Their fire shall not be quenched, and their worm shall not die.' (Homily 9 on First Corinthians, 3). Here is a helpful summary chart of all the Fathers, Saints, Bishops above, and what they believed from their extant writings about "HELL". There are others that may be cited (Origen of Alexandria, etc. who had unorthodox views and later influenced others, etc and more obscure writers like Arnobius of Sicca, etc who perhaps taught a form of 'conditionalism', etc) but those I have included here are considered the MAJOR orthodox Fathers and Bishops and Saints of the first five centuries of the Catholic Church. They are not inspired or infallible as individuals, and may have speculated beyond Scripture and tradition, but these prominent Christian writers at least provide us a reliable guide to what was believed as the 'tradition of the apostles' that was passed on by faithful men of God (e.g. 2 Thess 2:15; 3:6; 1 Cor 11:2; 1 Timothy 3:15; 6:20-21; 2 Timothy 1:13-14; 2:1-2; 3:14-17; Acts 2:42; Hebrews 13:7; Jude 3; 2 Peter 3:2; etc) from the earliest Christian centuries. 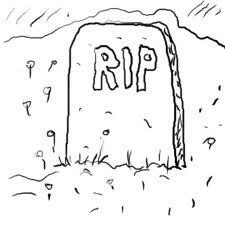 uses the words "eternal death, with punishment"
uses the biblical words 'destroy' and 'perish' but what meaning? "punished with terrible torture in unquenchable fire" or "punished with grievous torments in fire unquenchable"
"will depart into unquenchable fire" or "shall go away into everlasting fire"
compares the martyrs "torments" and "punishments" of this world to the "escape from that fire that is eternal and shall never be quenched"
compares the "seeming death" and "temporal fire" of this world to the "real death which is reserved for those who are to be condemned to eternal fire which shall torment forever those who are committed to it"
we will "receive immortality with either enjoyment or with pain"
after "this present life we shall live another life" which is either "with God" or without God "a worse one and in fire"
"God has NOT made us" like the animals "that we should [merely] perish and be annihilated"
the Scriptures make your way plain "for escaping the eternal punishments, and obtaining the eternal prizes of God" and to those who "seek immortality" (cf. Rom 2:7) "he will give life everlasting, joy, peace, rest, and abundance of good things" but "to the unbelieving and despisers...shall be anger and wrath, tribulation and anguish" (cf. Rom 2:8-9) "and at the last everlasting fire shall possess such men"
after Irenaeus we are into the early third century A.D. and the language only becomes clearer and more explicit for eternal punishment, eternal fire, etc. As we can see from the above chart, I do not place a SINGLE Church Father, Bishop, or Saint of the first four centuries of Christianity into the "annihilation" or "conditional immortality" camp. The evidence from the patristic sources is clear. Aside from Origen of Alexandria (and those he later influenced), the Fathers were indeed UNANIMOUS. The ones I have listed above either teach the orthodox, traditional doctrine on hell (that it is eternal, and conscious) or a variation of Origen's Apokatastasis (speculated on by St. Gregory of Naz and St. Gregory of Nys, and possibly St. Jerome) i.e. that all will eventually be saved, with a temporary 'purification' or purgatory-like state (cf. 1 Cor 3:10-15; 1 Peter 1:6-9; 1 Thess 5:23; Heb 12:14; Rev 21:27) required before entering heaven. Although NONE of the Fathers deny the language of Scripture about 'eternal punishment' and 'eternal fire' and 'tormented day and night forever and ever' (e.g. Matt 25:31-46; Rev 20:10-15; 2 Thess 1:5-10; etc), indeed they often affirm this language over and over again, however some have 'hope' that all will be eventually reconciled to Jesus Christ who is a God of love, mercy, forgiveness, and all-goodness, and will have everything subject to Him, that He may be 'all in all' (e.g. 1 Cor 15:24-28; cf. 1 Timothy 2:4,6; 2 Peter 3:9; etc). I will summarize some additional post-apostolic writings from Fr. Daley's The Hope of the Church: A Handbook of Patristic Eschatology (Baker, 2002) which is very dense and detailed on the first 700 years of the Church (the entire patristic period). Some of that eschatology is on the nature and duration of hell and punishment in the afterlife. I will supplement from other scholarly sources (e.g. J.N.D. Kelly of Oxford, etc) where appropriate. others that only those sinners who had neglected to practice almsgiving when alive were destined to eternal chastisement. ". . . the everlasting death of the damned, i.e. their alienation from the life of God, will abide without term [i.e. without end]" (Augustine, Enchir 112). Chapter 112. There is No Ground in Scripture for the Opinion of Those Who Deny the Eternity of Future Punishments. It is in vain, then, that some, indeed very many, make moan over the eternal punishment, and perpetual, unintermitted torments of the lost, and say they do not believe it shall be so; not, indeed, that they directly oppose themselves to Holy Scripture, but, at the suggestion of their own feelings, they soften down everything that seems hard, and give a milder turn to statements which they think are rather designed to terrify than to be received as literally true. These are sources by orthodox, traditional Christian believers in eternal hell, both Catholic and evangelical Protestant Christians that document clearly that the Bible and the early Church Fathers DO teach the doctrine. This last tome is an exhaustive historical study in two detailed volumes (over 1300 pages!) which I don't have yet (rather expensive! ), but I have listened to the author in several lectures available online. McClymond (Protestant historian teaching at St. Louis University) traces the original 'universalism' to the early Gnostics (later found in Origen in his 'restoration of all things' belief) and contends it is not a 'biblical' idea but a gnostic error.